Add cashews, sunflower seeds, half of the nutritional yeast, salt, pepper, garlic pepper and cayenne pepper to a food processor or blender and blend/pulse into a fine meal, scraping down sides as needed. Add spice mixture to the kale and toss with hands to distribute, working it into the grooves so it’s thoroughly coated. 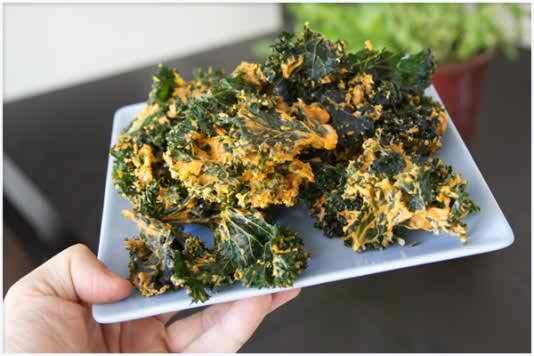 Divide kale between 2 large baking sheets and spread into an even layer, making sure the pieces aren’t overlapping to ensure crispiness. You may need to bake them in two batches depending on size of baking sheets. Now place all your trays in the dehydrator for about 6 to 8 hours at 115 degrees. The timing will vary based on thickness of the cheese and the humidity. The best practice is to just keep checking them and doing a small taste test every few hours the first time you make them. When they are dry enough and taste great… stop the dehydrator and place all the chips in some zip lock bags or a glass storage containers. Remember, if you dry them too long, they will become very brittle and almost burnt like. So don’t over dry them and don’t turn up the heat too high. I would even say under dry them a little so they still have some flex to them. I like them that way. More jerky like than dried leaf like. The cheese will take longer to dry than the kale. Bake for 15 minutes. Then remove from oven and toss/flip kale to ensure even baking. Bake for 5-10 minutes more, or until chips are crispy and golden brown. Watch carefully to ensure they don’t burn. Let cool slightly before enjoying.